How does your garden grow? Everything is better with free things! So, why not gardens? We’ve harvested a TON of free things you can get to help your lawn and garden grow better. 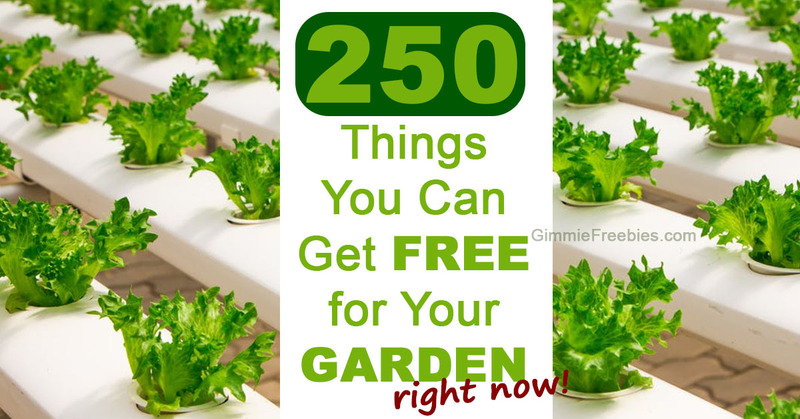 Get ready to plant your garden with our big list of garden freebies! From vegetable plants, herbs, flowers and lawn care tips – we’ve got something to help make every green thumb greener! Don’t miss the hundreds of free books on Amazon. Plus, 60 free catalogs (many include high-value coupons!) Composting, and other tips and hacks. Where to find a master gardener, and how to plan your garden with free tools. Recipes for freshly grown produce. And even garden giveaways! Garden Magic In Your Backyard! : The Experts tell you how – covers a variety of subjects like perennials, bulbs, pruning, mulch, vermiculture and more. A to Z Gardening for Beginners This guide will help you know all the basics of gardening. Everything from types of gardens, how much sunlight plants need, companion planting, essential garden tools to have, and much more. When you’re done reading, you’ll be fully prepared to create your garden and make it one of the best! To request yours, simply click the links and give them your shipping info so they can send your freebie to you! Gardeners Idea Book from Proven Winners – add “WOW” to your garden! Create beds of lasting color. Turn foliage into focal points. Plant colorful containers with high impact. Find blooming shrubs for your region! Annie’s Annuals – Order their catalog for exclusive plants. Sign up for their newsletter and get nursery news and info on our sales days. Burpee – Order their catalog and you will also be eligible for a money saving promo code on your first order. Gurney’s Seed & Nursery – Order their catalog and also get a coupon for $25 OFF your purchase! You can also request a catalog for your friends! Johnny’s Selected Seeds – Sign up for their catalog and you can also sign up for their newsletter which will have savings, product news and more. There’s no better soil to grow big healthy plants than soil you made yourself! Grab some FREE Starbucks coffee grounds! and set up your ultimate compost. Check with your local Starbucks to see if they are participating. This is on a first come, first serve basis. They give away large 5-pound bags of coffee grounds for free. Here are some great tips for keeping critters out of the garden. Find a master gardener in your area for free! How to freeze zucchini so it’s not mushy! Win $1000 High Country Gardens Gift Card in the High Country Gardens 25th Anniversary Garden Giveaway!! The grand prize is a $1000 High Country Gardens Gift Certificate and one-hour garden consultation by phone with High Country Gardens founder and chief horticulturist David Salman. There is also weekly wins of a Pre-Planned Garden! Sweepstakes ends April 30, 2018, at 11:59 PM. Win a Year of Produce! Enter The Buddy Fruits 2018 Free Produce Sweepstakes The Grand Prize is – One (1) Year supply of Produce, awarded in the form of a $2,600 check. Ends at 11:59 p.m. ET on March 31, 2018. Check out more awesome giveaways here!